I don't ordinarily veer off the topic of food. But, this is something I felt compelled to share. I hope you find it inspiring. I hope it makes you want to fist pump the air and give a little shout. And I'm hoping it's also something you'll take to heart and share with other like-minded humans. It's a keynote speech that was delivered at the Milwaukee Business Journal's Women of Influence awards event this past week. But, it's probably not like any speech you've read lately. Please read -- and then pass it on to amazing women everywhere! So who is Juli Kaufmann? Some know her as the President of Fix Development, a Milwaukee consulting company at the fore of projects that create more sustainable communities. In fact, many people (including myself) got to know Kaufmann after she finished one of her most well known projects -- The Clock Shadow Building- home to Wisconsin's first urban cheese factory. But, Juli Kaufmann is much more. She's also the founder of Fund Milwaukee, a group that provides opportunities for investment in small, locally owned businesses. And the manager for Afterglow Farm, a 400-acre farm just north of Milwaukee that is building a brand new template for best practice in sustainable agriculture. In 2013, she herself was nominated as a Woman of Influence by the Milwaukee Business Journal. And that's not all... every time I turn around, Juli is starting up something new (and amazing) here in my city. Suffice it to say, she's the embodiment of so much of what's good and right in our Milwaukee community. I'll be honest, I'm a tough sell when it comes to cupcakes. They're cute as can be, but they almost never compare -- in my mind -- to a nice, moist slice of cake. 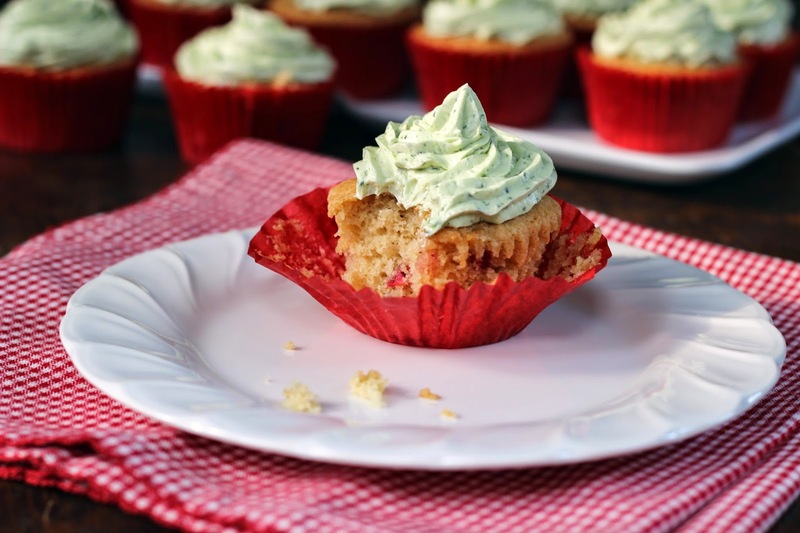 But, cupcakes do offer the advantage of being a nice way to provide single servings of dessert for backyard barbeques and gatherings, without the hassle of cutting and serving. So, I'm aways on the lookout for ways to work them into my repertoire. Lately, I've been obsessed with the idea of pairing up summer herbs with fruit. They have such an affinity for one another, and I'm often amazed that more recipes don't utilize the wonderful grassy, earthy qualities of herbs to enhance their baked goods. So, I started off by playing around with cupcakes. These beauties were the result of an experiment combining strawberries and basil. And -- dare I say -- I may have found a cupcake that I'll make time and time again. The buttery vanilla and fresh strawberry batter is moist and fruity. It doesn't rise sky-high due to the moisture content of the fruit, but I also didn't have the typical issue of the cupcakes sinking in the middle as some fruit-filled cakes tend to do. 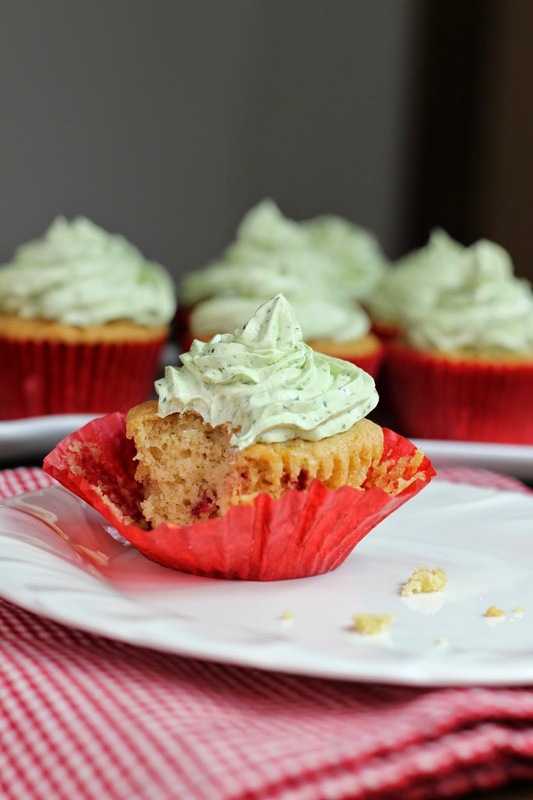 Even better, the rich, fluffy basil buttercream frosting provides a perfect light, sweet summery flavor. It's easy to work with for piping and spreading. And I really love the look of the gorgeous green flecks of basil. Despite my cupcake nay-saying, I might be in love.